Today I will tell you about another new job that is a lecturer and this job has been announced by Fazaia Degree College Risalpur Nowshera. 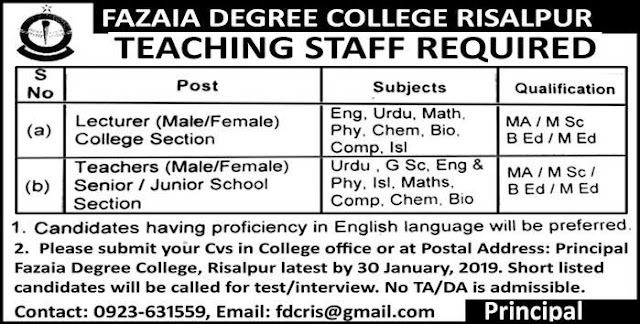 Men and women are eligible to apply both in Fazaia Degree College Risalpur.In all the jobs in which English is very good, it will be most preferred. In this job, you will be given a great salary package. If you want to be a lecturer, this job is only for you, you must apply it because it is a very good job. I will give you complete information about all these jobs, but I will also tell you the complete procedure for applying. If you like this article, then Please should express their opinion in the comments section. Your feedback can make this website very good. Jobs Junction Online this website has become Pakistan's largest job information web site. Please Submit your CV in the college office or at postal address. Principal faizaia degree college Risalpur Nowshera.